We want to remember the victims from the awful March 15 terrorist attack in Christchurch, New Zealand. So far it is being reported that 49 people died during the shooting at the two mosques while 48 were injured. Of the 48 injured, 39 are still in the hospital with 11 in the intensive care unit. Read on for information on some of the victims and the latest developments from the tragedy, including news on how gun laws may be set to change in New Zealand. Daoud Nadi, 71, came to New Zealand from Afghanistan in the 1980s and was a community leader in Christchurch. It is believed he threw himself in front of the gunman to prevent other deaths. Naeem Rashid, 50, is being hailed as a hero after attempting to tackle the shooter. Tahla Rashid, 21, had just gotten a new job and had plans to get married. Farhaj Ahsan, 30, was an electrical engineer who is survived by his wife and two young children. Hosne Ara, 42, reportedly rushed toward gunfire to try to save her husband, who uses a wheelchair. Her husband has reportedly survived. Khaled Mustafa was a Syrian war refugee. Amjad Hamid, 57, is believed by his family to be dead. He was a doctor specializing in cardiorespiratory illnesses. Hussain al-Umari, 35, was excited to go to his place of worship then have dinner with his parents afterward. Lilik Abdul Hamid is the first Indonesian to be confirmed dead in the attack. Many other victims of Jordanian, Egyptian, and Pakistani origins have yet to be identified. They were all clearly upstanding members of their community with their own significant contributions. Some were young children who will sadly never get a chance to make their own mark on the world. All will be remembered with love. We continue to keep them and their loved ones in our thoughts, and send love, healing, and strength to the community and people all over the world who have been affected by this tragedy. In the wake of the terrorist attack, New Zealand gun laws are set to change, according to lawmakers. The main suspect used two semi-automatic weapons, two shotguns, and a lever-action firearm. He obtained his gun license in 2017. New Zealand has a population of 4.6 million with more than 1.2 million guns in possession among them. New Zealand law states that anyone 16 and over can apply for a gun license, while anyone 18 or older can seek a permit to obtain a military-style semiautomatic weapon. 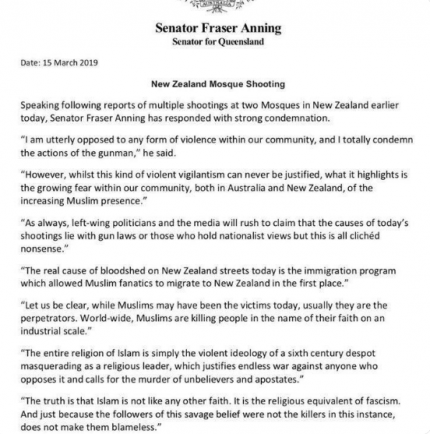 Queensland senator Fraser Anning issued a truly awful, quite frankly disgusting statement following the terrorist attack, essentially blaming Muslims for the massacre. Chelsea Clinton is also trending on Twitter after being confronted by a young woman during a vigil in honor of the victims of the terrorist attack held at New York University. This is reportedly in response to Chelsea’s condemning of Rep. Ilhan Omar (D-Minnesota), who was accused of using anti-Semitic language in a tweet posted last month. Reactions on Twitter are divided, with some supporting Leen and others on Chelsea’s side. Shout out the liberals and centrists who, joining right wingers, have helped make the story about the massacre in NZ about Chelsea Clinton here in the US and a college student who was mean to her. You guys are the real ones. Others refocused attention on the victims, which is really what we should all be doing. Evil white supremacist terrorists murdered 49 Muslim worshippers and filmed it. But today more people are talking about Chelsea Clinton and #eggboy. Instead of focusing on Chelsea Clinton, turn your attention to the victims. It’s no surprise that people like #eggboy and Chelsea Clinton are trending, because that is the kind of stuff that gets attention these days and goes viral, especially on social media. We wish all 49 names of the victims were trending instead. They’re the ones who deserve all the attention from the media and around the world, and they were all taken too soon. Once again, sending their loved ones and the entire Christchurch community our love and support.